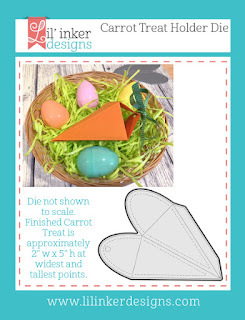 Easter is almost here! Wow, this year is flying by! 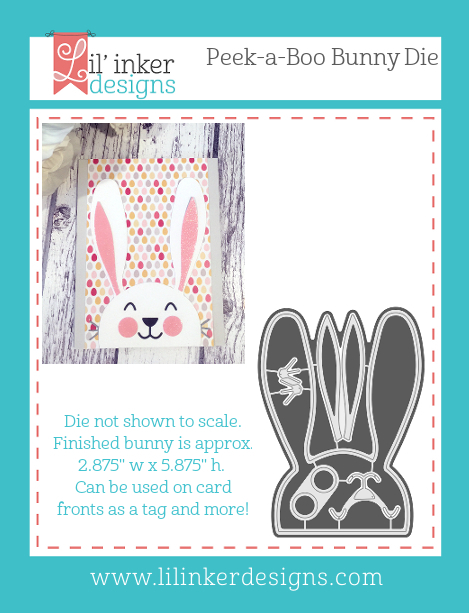 I wanted to share another card I made using the fun Cover Up Die: Easter Egg Pop Up. Oh goodness, this die is fun! I shared a card where I colored the images in a similar fashion here. 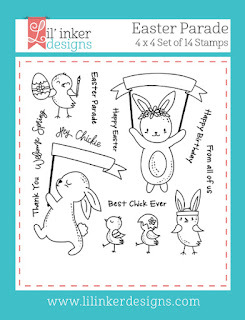 For the eggs I used several stamp sets from Lil' Inker Designs but mainly the Unstoppable Stamps. 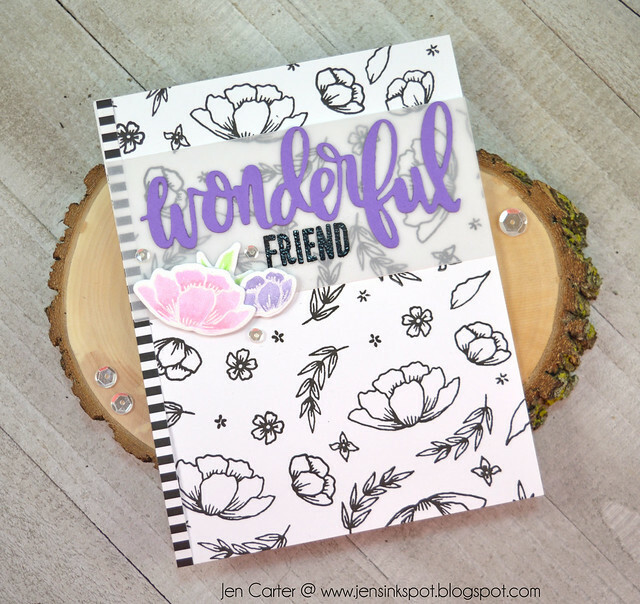 I stamped them with lots of fun Catherine Pooler Ink colors. 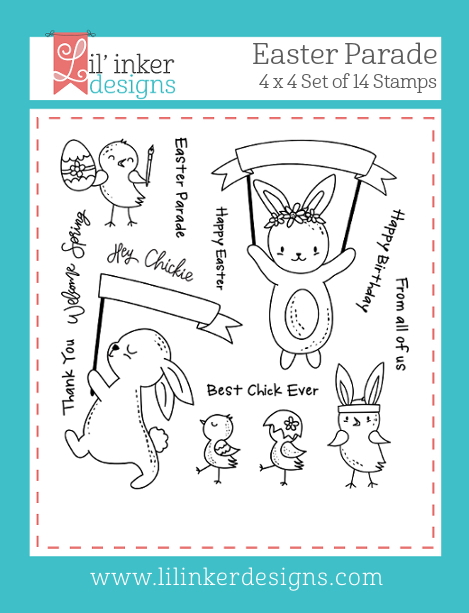 The large friend is from the Friend Stamp set and "Happy Easter" comes from the Happy Bunny Stamp set. 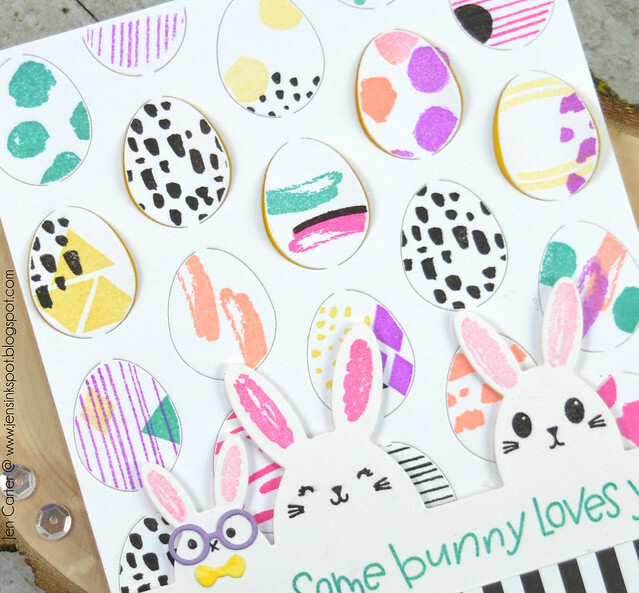 I layered yellow cardstock behind the pop up eggs die and you can see the yellow from behind the eggs I popped up. 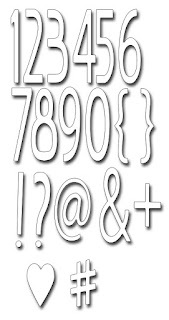 Shop here for Lil' Inker Designs products. 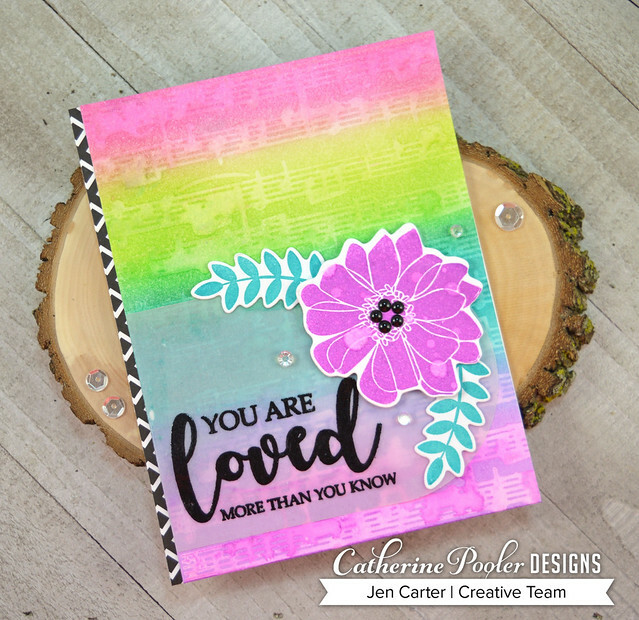 Welcome to release day for Catherine Pooler's All that Jazz product line! 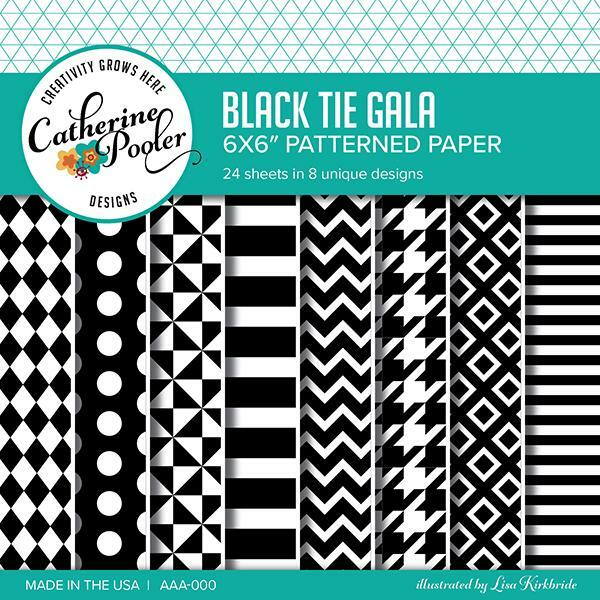 Products are now available for purchase in the Catherine Pooler store including the much anticipated All that Jazz ink! Yippee! 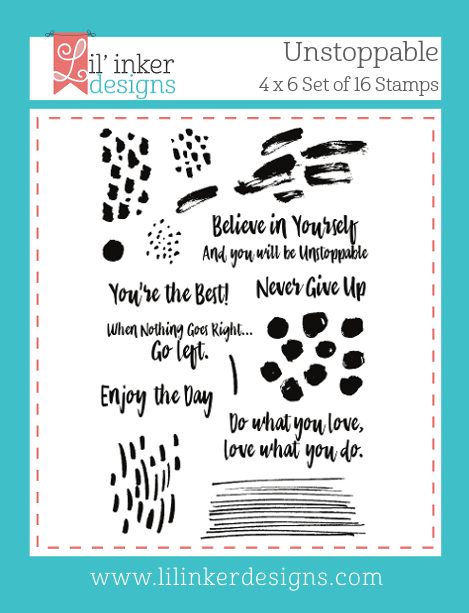 I really like the large sentiment in the Grateful Heart stamp set that says, "A grateful heart is a magnet for miracles". How cool is that? For this card I watercolored the background using five Catherine Pooler ink colors: Garden Party, Tiki Torch, Tiara, Flirty Fuchsia & Party Dress. After the background dried I stamped the sentiment form the new Grateful Heart stamp set. I die cut some of the flowers from the Grateful Heart die set, stamped them with the coordinating Grateful Heart stamp set and embossed them in white. I then watercolored using the inks from the background and also using a little bit of Lime Rickey in the leaves to add some contrast. I added some glitter from a Nuvo Aqua Shimmer pen on top of the flowers. For my last card for today I used several other new products that are now available to order. I first used the super cool & new Square Dance Stencil and blended It's a Girl, Rose Petals, Mint to Be & Seafoam inks over the stencil onto white cardstock, overlapping colors as I moved to the middle. 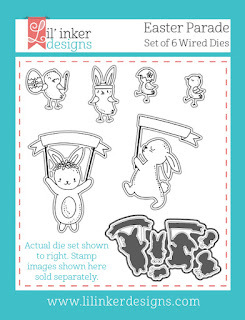 I die cut the tag with the Tags, etc die set (Get this! You'll love the versatility!). I stamped the sentiment on to the tag, masking off the very bottom, from the Good Things stamp set. 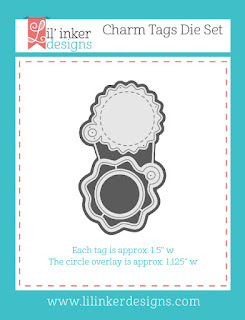 I die cut the new Wonderful die three times out of black cardstock and adhered them together and then attached it to my tag. 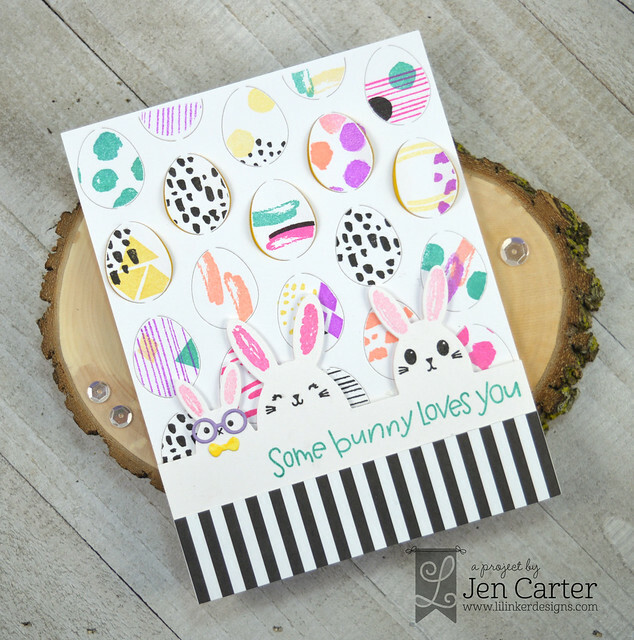 The gorgeous black and white paper that you see peeking out underneath the white & pink layers is an item that you'll want to get quickly because it will sell out. 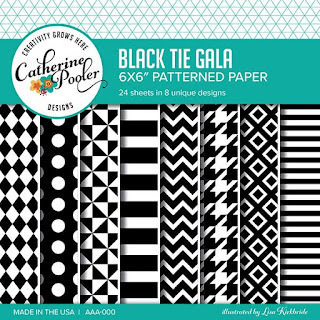 It's called Black Tie Gala Patterned Paper. Everything I've shared today is available to order now here...and that includes the long anticipated All that Jazz ink! You'll even find the "I Want it all Bundle!". Leave a comment on my blog for your chance to win! We’ll randomly choose a winner from FIVE different blogs to win two free ink pads from our shop along with FREE shipping on your order! Winners announced on Friday, March 23 on Catherine's blog. Hello! 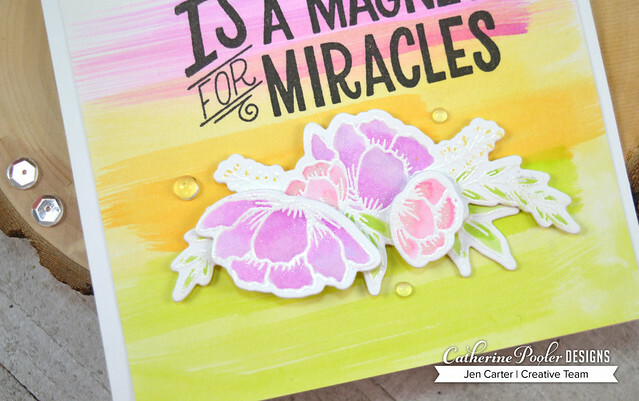 Welcome to a sneak peek of the newest Catherine Pooler release! The products I am showing today will be available for purchase on Tuesday, March 20th at 9 AM CST. Isn't that generally the case? Sometimes we can feel so alone but often we have our own little cheering section that we overlook. When times are hard those are the people who show up! I went bright and bold with this card! 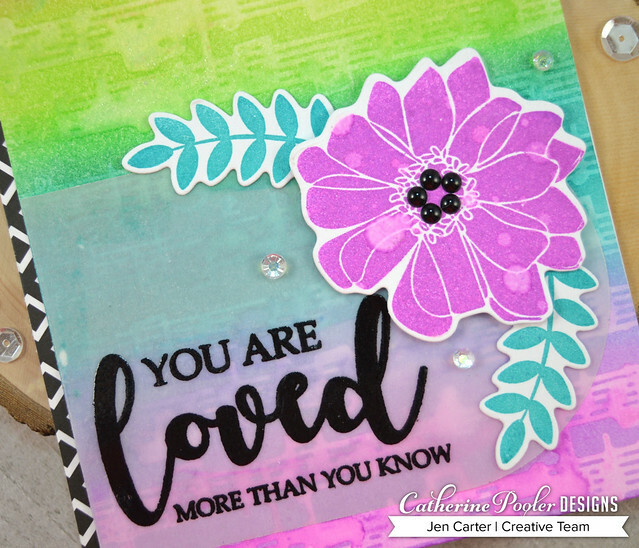 With Catherine's inks it is easy to do! I took a piece of Bristol Smooth paper and then inked it up with a foam blender and Flirty Fuchsia, All that Jazz (it is FINALLY releasing tomorrow!!!! ), Garden Party & Be Mine (coming soon) inks. It looks like I used more inks because when the inks are blended together they create such beautiful colors! 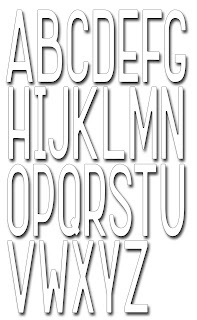 Once I had my background inked I took the new Music Notes Background stamp, spritzed it with water and then stamped it onto the background. 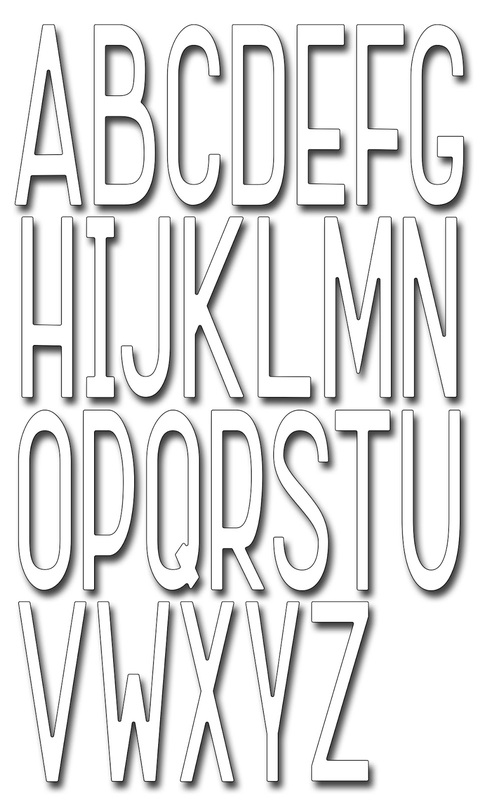 It reacts with the ink to create a watermark background! I added a strip of the gorgeous, must have Black Tie Gala Patterned Paper to the side of the card base. I die cut a piece of NEW! 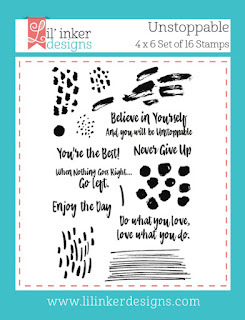 80 lb Vellum with the Tags, Etc die set and then stamped and embossed in black the beautiful new sentiment from the new Grateful Heart Stamp Set. 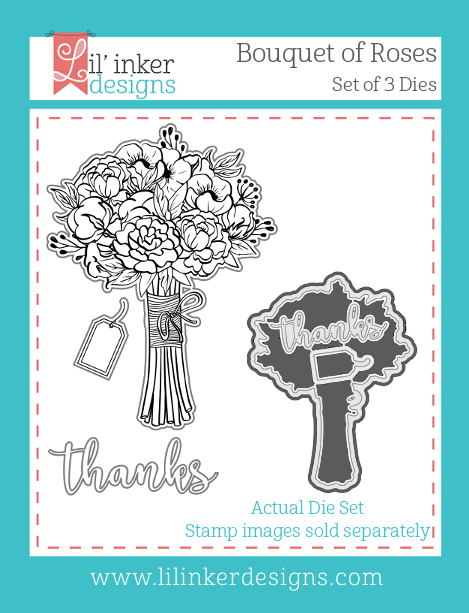 I die cut the flower & leaves with the Bloomin' Bouquet die set and stamped them with the coordinating Bloomin' Bouquet stamp set (releasing on March 20). 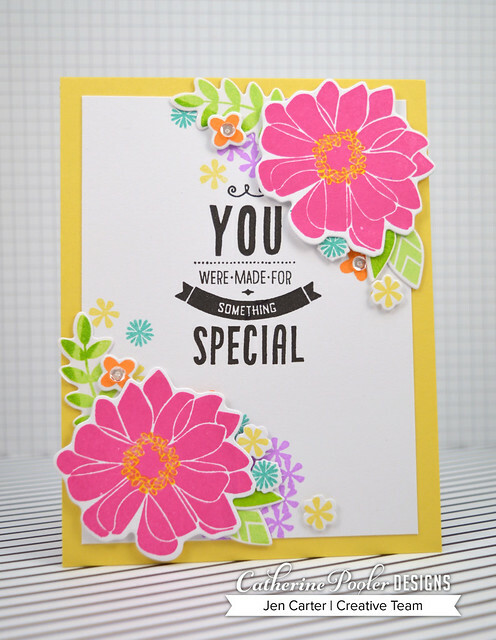 The flower is stamped with Flirty Fushcia ink & the leaves with All that Jazz ink. I spritzed the flower with water and added some black enamel dots to the center. I layered all of that on the vellum tag and attached to my card base. I went with bright colors again for this card. 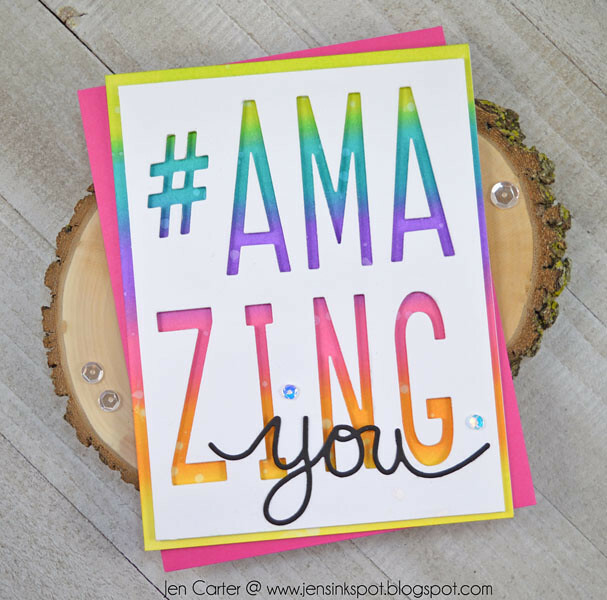 Because let's face it...Catherine's inks are so beautiful and make gorgeous, colorful cards! For this card I stamped the flowers with the Counting Blessings: Bloomin' Bouquet Stamps & die cut some of them out with the coordinating Bloomin' Bouquet dies. The colors I used are Party Dress, Tiki Torch, Tiara, Aquatini, Pixie Dust, Garden Party & Lime Rickey. I stamped the sentiment using the Counting Blessings: Good Things stamp set. To finish it off I added a few clear sequins and attached to a yellow card base. If you are seeing new items you'd like to add to your stash they can be purchased tomorrow at 9 AM EST. Here's a look at the new items that will be available. 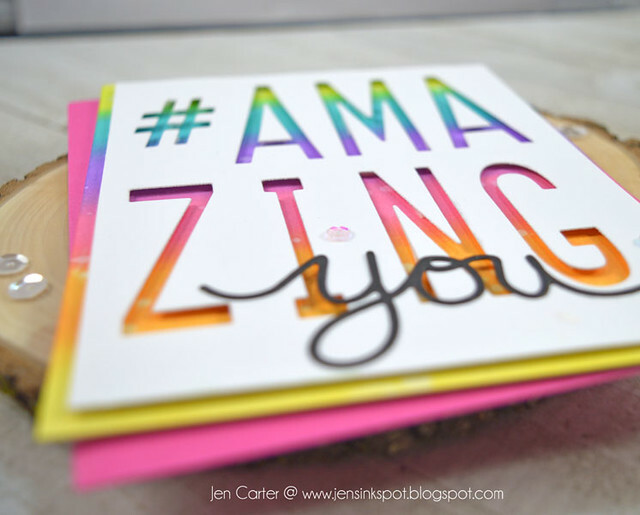 Jen Carter - You are here! 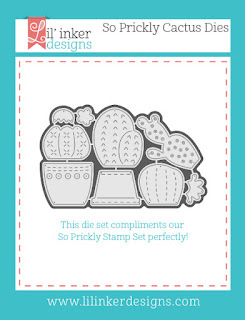 A little over two years ago Lil' Inker Designs released a cute stamp set called So Prickly. 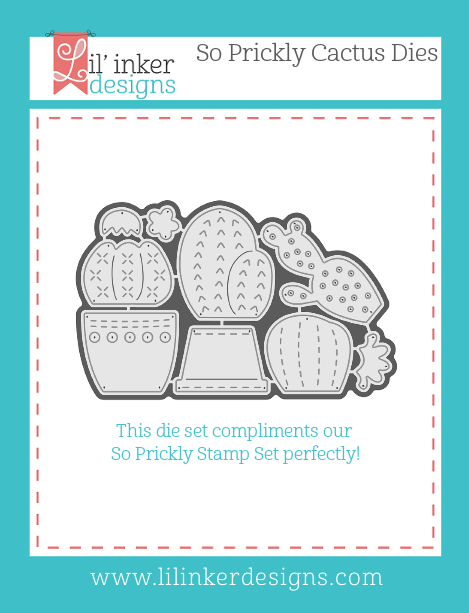 Today we are bringing you So Prickly Cactus dies that coordinate perfectly with the stamp set but work well by themselves too. I started by die cutting a piece of white cardstock with one of the Stitched Mats: Side Stitched Rectangles dies and then trimmed off the side so it was the size I needed for my cacti. 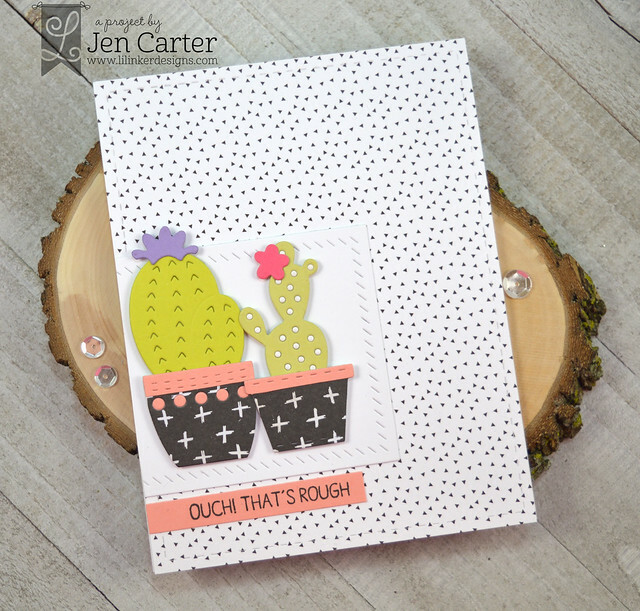 I then chose a patterned paper for my cacti pots that I had die cut with the So Prickly Cactus dies and added a piece of light orange cardstock to the tops for some contrast. I die cut the cacti and the blooms and then attached the assembled images to my panel. I die cut the background patterned paper card panel with the largest Stitched Mats: Rectangles die. 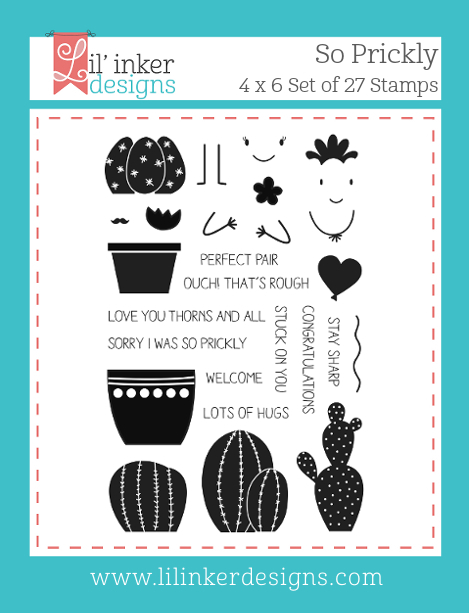 The sentiment was stamped using the coordinating So Prickly stamp set. 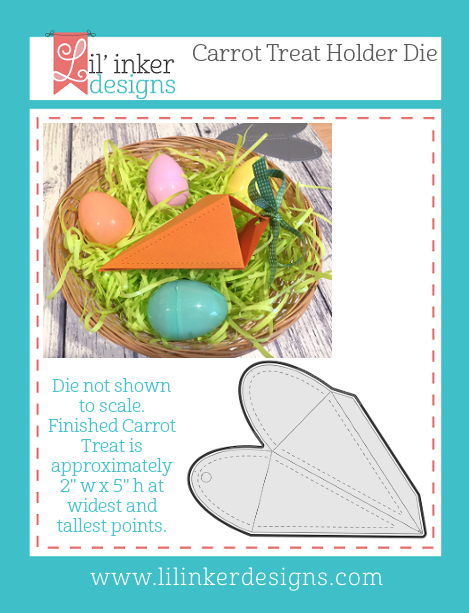 For this last card I am sharing another new die set that is also part of a series. 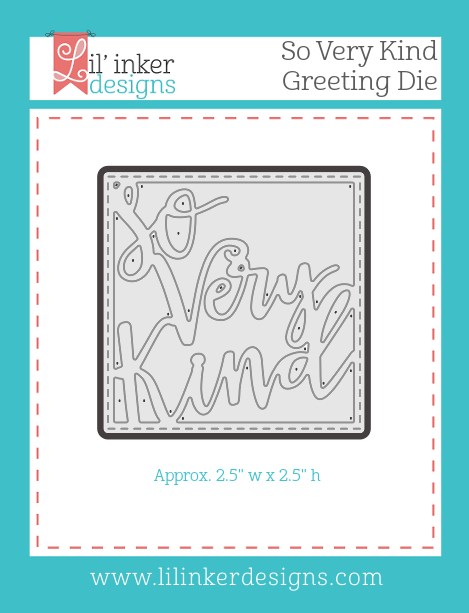 This one is called So Very Kind Greeting die. I die cut the So Very Kind Greeting die out of a piece of Dip Dyed Ombre Paper and then backed it with a piece of white glitter paper to add some shine. 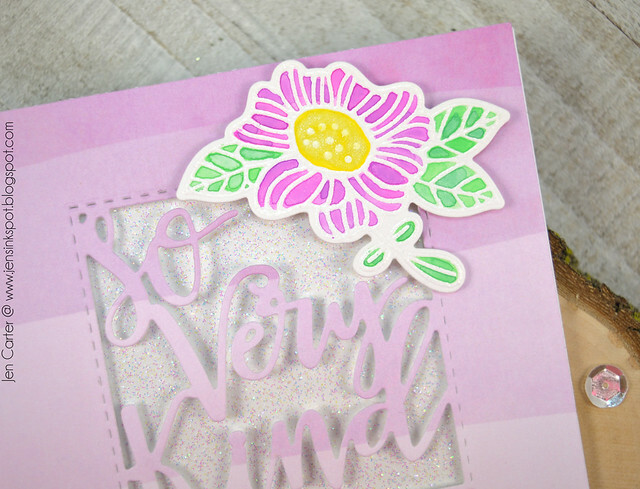 I die cut and watercolored one of the flowers in the Encouraging Words stamp set and adhered it to the corner of the card. 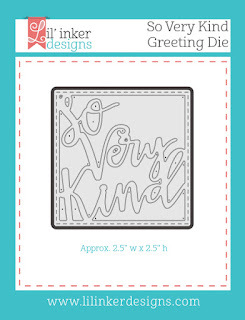 The nice thing about the So Very Kind Greeting die is that you can make quick and simple cards! 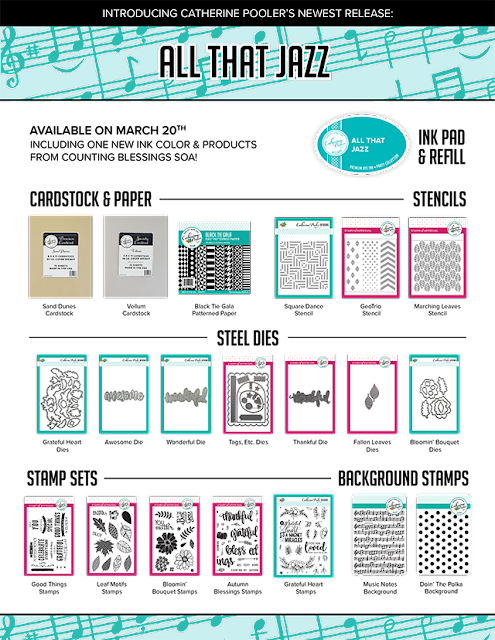 Here's a last look at all of the new products that are now available in the Lil' Inker Designs store. 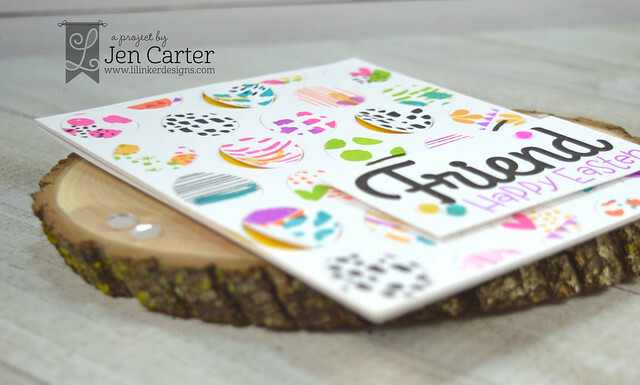 Be sure to comment on my blog for your chance to win the entire March release from Lil' Inker Designs! 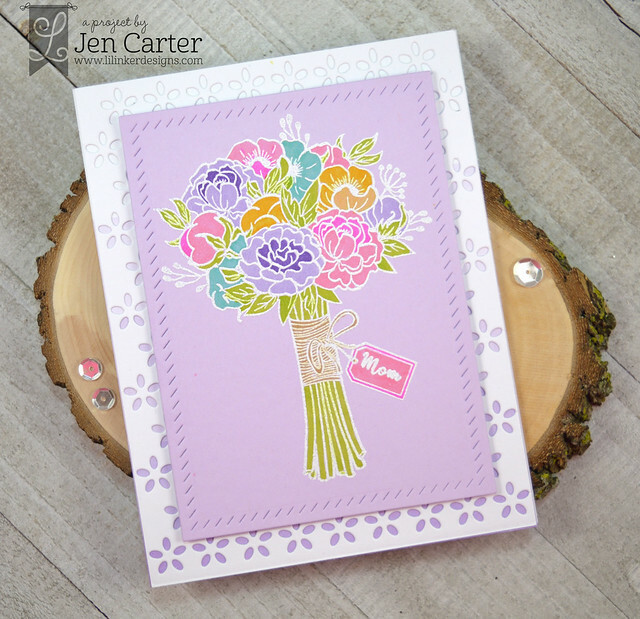 Today I have two more spring cards to share with you. 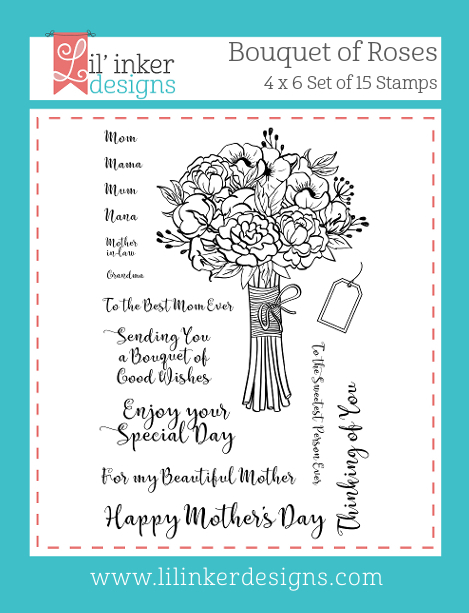 This new Bouquet of Roses stamp set is so gorgeous and for this card I decided to try a technique that I haven't done for a while! For this card I first took a piece of light purple cardstock and die cut it with the Stitched Mats: Side Stitched Rectangles die. I then took the large image from the Bouquet of Roses stamp set and embossed it in white on my panel. I then colored the image with my copics. I love the way this turned out! I added the little tag and sentiment to the tag (lots of options on how to do this!) using the extra stamps in the set. 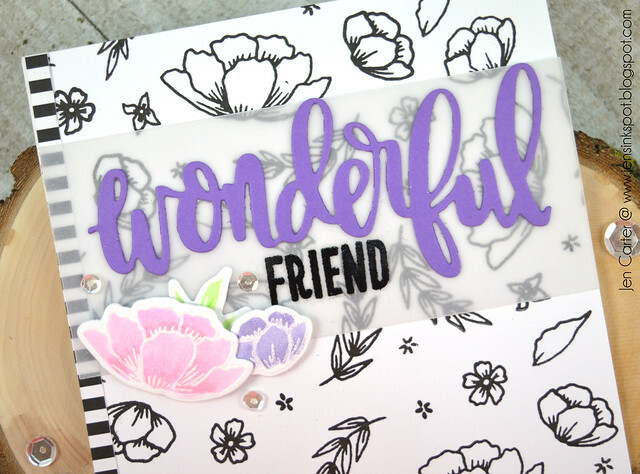 For the background of my card I die cut the gorgeous Cover Up Die: Eyelet on white cardstock and then backed it with a piece of purple ombre paper from the Dip Dyed Ombre Paper Pad. 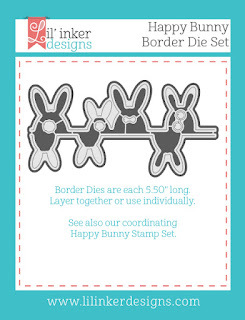 My second card today combines two new die sets and a new stamp set as well. 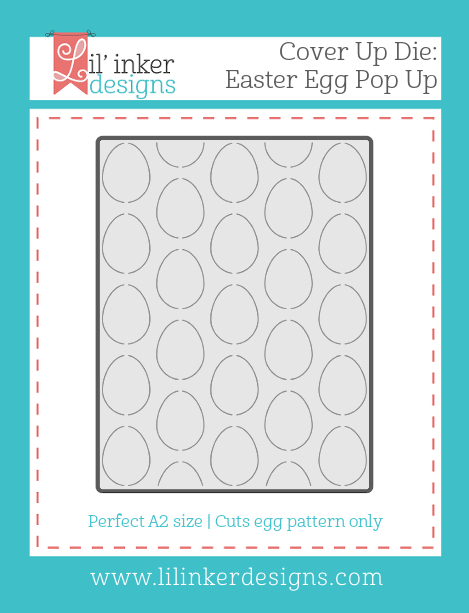 I started by die cutting that fun egg background with the new Cover Up Die: Easter Egg Pop Up. I then created a mask by die cutting the background a second time with thin typing paper. 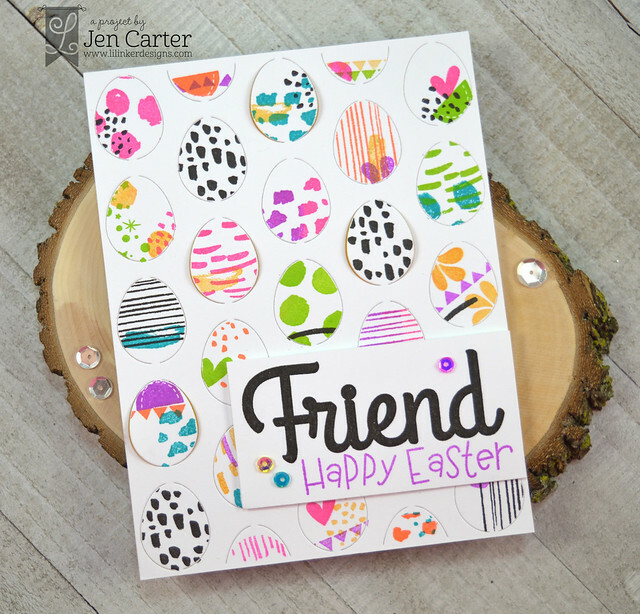 I cut one of the eggs out and then used it as a mask as I stamped the images on each egg using the Unstoppable Stamps using Catherine Pooler inks. 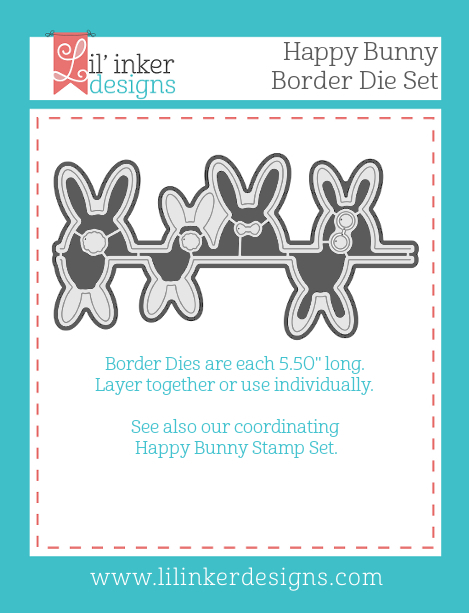 Next, I die cut the adorable bunny border with the new Happy Bunny Border die (there are two dies that you can overlay for more bunnies!) 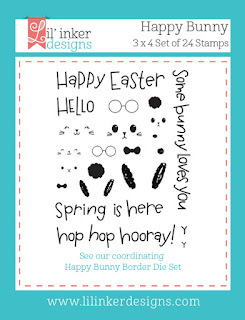 from white cardstock and then stamped the images on the bunnies & the sentiment using the coordinating Happy Bunny stamp set. I added glasses & a bow tie with dies from the Happy Bunny Border die set. I just LOVE those little tiny details! I'm going to enter this card in the Simon Monday Challenge to create a Spring card. 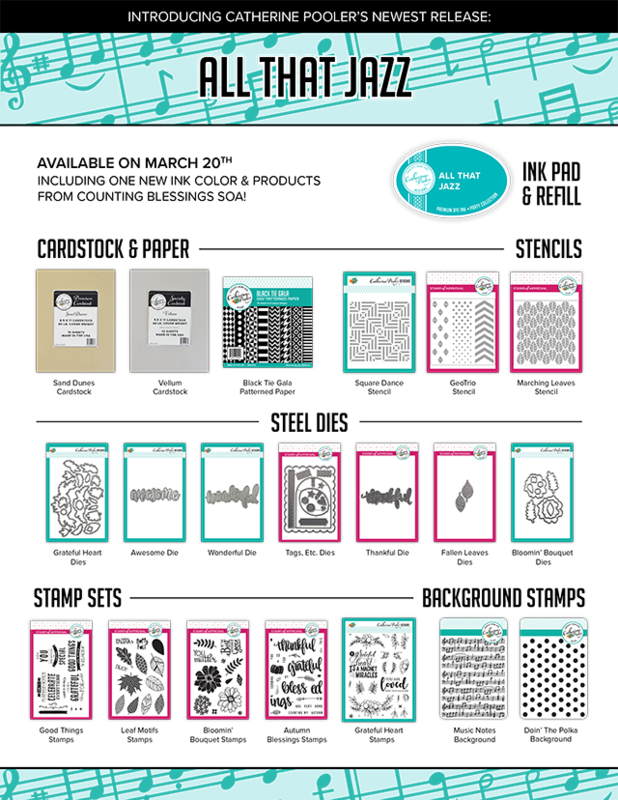 Here's a look at all of the new products included in this release. 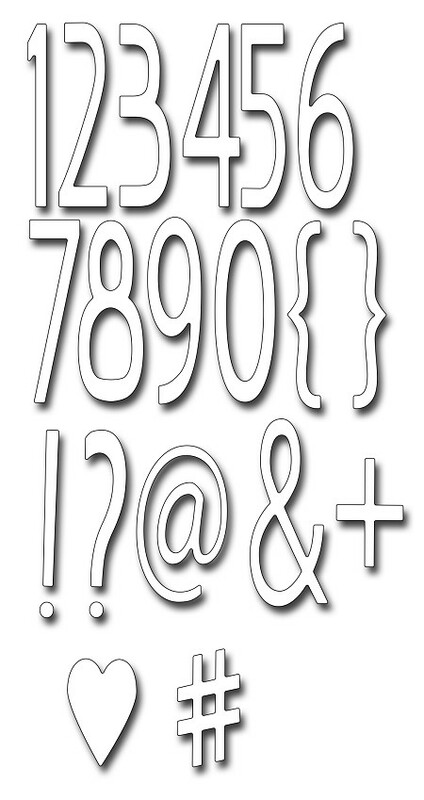 They are all available now in the Lil' Inker Designs store.